Pamphylia (Ancient Greek: Παμφυλία, Pamphylía, modern pronunciation Pamfylía /pæmˈfɪliə/) was a former region in the south of Asia Minor, between Lycia and Cilicia, extending from the Mediterranean to Mount Taurus (modern-day Antalya province, Turkey). It was bounded on the north by Pisidia and was therefore a country of small extent, having a coast-line of only about 120 km (75 miles) with a breadth of about 50 km (30 miles). Under the Roman administration the term Pamphylia was extended so as to include Pisidia and the whole tract up to the frontiers of Phrygia and Lycaonia, and in this wider sense it is employed by Ptolemy. Anatolia/Asia Minor in the Greco-Roman period. The classical regions, including Pamphylia, and their main settlements. The name Pamphylia comes from the Greek Παμφυλία, itself from Ancient Greek: πάμφυλος (pamphylos), literally "of mingled tribes or races", a compound of πᾶν (pan), neuter of πᾶς (pas) "all" + φυλή (phylē), "race, tribe". 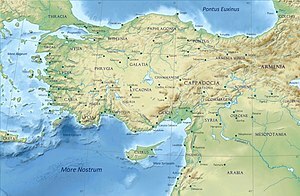 Herodotus derived its etymology from a Dorian tribe, the Pamphyloi (Πάμφυλοι), who were said to have colonized the region. The tribe, in turn, was said to be named after Pamphylos (Greek: Πάμφυλος), son of Aigimios. The Pamphylians were a mixture of aboriginal inhabitants, immigrant Cilicians (Greek: Κίλικες) and Greeks who migrated there from Arcadia and the Peloponnese in the 12th century BC. The significance of the Greek contribution to the origin of the Pamphylians can be attested alike by tradition and archaeology and Pamphylia can be considered a Greek country from the early Iron Age until the early Middle Ages. There can be little doubt that the Pamphylians and Pisidians were the same people, though the former had received colonies from Greece and other lands, and from this cause, combined with the greater fertility of their territory, had become more civilized than their neighbours in the interior. But the distinction between the two seems to have been established at an early period. Herodotus, who does not mention the Pisidians, enumerates the Pamphylians among the nations of Asia Minor, while Ephorus mentions them both, correctly including the one among the nations on the coast, the other among those of the interior. A number of scholars have distinguished in the Pamphylian dialect important isoglosses with both Arcadian and Cypriot (Arcadocypriot Greek) which allow them to be studied together with the group of dialects sometimes referred to as Achaean since it was settled not only by Achaean tribes but also colonists from other Greek-speaking regions, Dorians and Aeolians. The legend related by Herodotus and Strabo, which ascribed the origin of the Pamphylians to a colony led into their country by Amphilochus and Calchas after the Trojan War, is merely a characteristic myth. A treaty between the Hittite Great King Tudhaliya IV and his vassal, the king of Tarhuntassa, defined the latter's western border at the city "Parha" and the "Kastaraya River". The river is assumed to be the classical Kestros (Turkish Aksu Çayı); Parha, the future Perge. West of Parha were the "Lukka Lands". The Pamphylian language was likely a late Luwic dialect, related to Carian, Lycian, Lydian and/or Milyan. When the region returns to history its population is "Pamphylian", that is Greek-speaking. On Cyrus's defeat of Croesus, Pamphylia passed to the Persian Empire. Darius included it in his first tax-district alongside Lycia, Magnesia, Ionia, Aeolia, Mysia, and Caria. At some point between 468 and 465 BC, the Athenians under Cimon fought the Persians at the Eurymedon, and won; thus adding Pamphylia to their "Delian League" empire. Toward the end of the Peloponnesian War, the Athenians were weakened enough that the Persians were able to retake it. Upon Alexander the Great's defeat of Darius III, Pamphylia passed back to Greek rule, now Macedonians. After the defeat of Antiochus III in 190 BC they were included among the provinces annexed by the Romans to the dominions of Eumenes of Pergamum; but somewhat later they joined with the Pisidians and Cilicians in piratical ravages, and Side became the chief centre and slave mart of these freebooters. Pamphylia was for a short time included in the dominions of Amyntas, king of Galatia, but after his death lapsed into a district of a Roman province. As of 1911, the district was largely peopled with recently settled Ottoman Muslims from Greece, Crete, and the Balkans, as a result of the long-term consequences of the Congress of Berlin and the collapse of the Ottoman Empire. One or more of the preceding sentences incorporates text from a publication now in the public domain: Chisholm, Hugh, ed. (1911). "Pamphylia" . Encyclopædia Britannica. 20 (11th ed.). Cambridge University Press. p. 662. ^ George Grote : A History of Greece. p. 286; Irad Malkin : Myth and Territory in the Spartan Mediterranean. Cambridge U Pr, 2003. p. 41. ^ Jona Lendering - Livius.org, http://www.livius.org/articles/place/pamphylia/? ^ "Dictionary of Greek and Roman Biography and Mythology, page 1015 (v. 1)". Ancientlibrary.com. Archived from the original on 2012-11-02. Retrieved 2013-09-03. ^ Die Fragmente Der Griechischen Historiker, Continued - Google Boeken. Books.google.com. Retrieved 2013-09-03. ^ "links to Greek and Latin Authors in the web". Attalus. Retrieved 2013-09-03. ^ SEG 23:573 R.S. Bagnall (1976) The Administration of the Ptolemaic Possessions outside Egypt, p. 124. Brill Archive. ^ "Aspendos Archaeological Project". Aspendosproject.com. Retrieved 2013-09-03. ^ "Internet Medieval Sourcebook". Fordham.edu. Retrieved 2013-09-03.